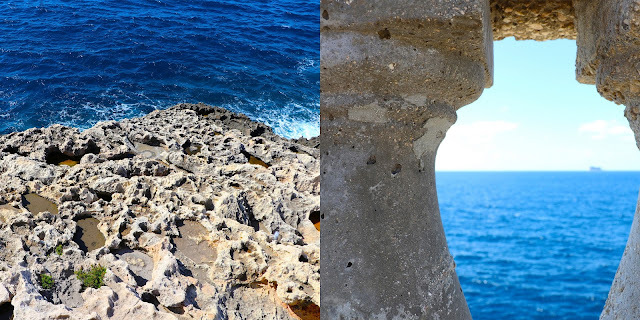 One of the best aspects of Malta is the natural beauty of the island. After checking out Valletta and Mdina, our next day was spent traipsing across the southeast corner of the island. 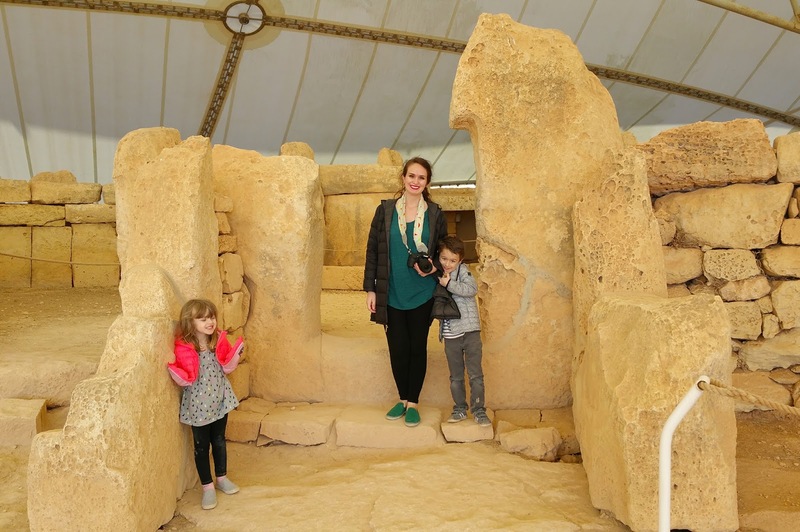 First stop: the prehistoric megalithic temples of Ħaġar Qim and Mnahjdra. These complexes are the best preserved and most intriguing of Malta's prehistoric sites. The first temple we reached was Ħaġar Qim with its impressive trilithon entrance. It dates from 3600 to 3000BC. Some of these massive stones weigh upwards of 20 tons! How these ancient peoples maneuvered these into place is still a mystery. 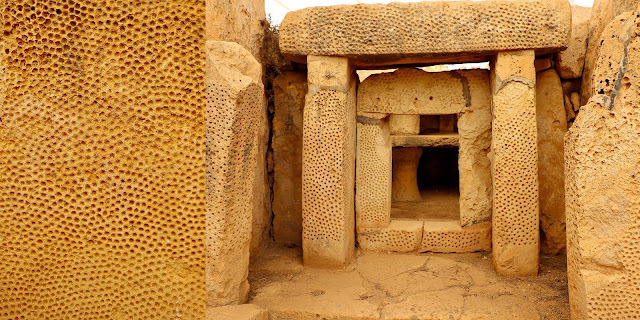 The temples were originally roofed over, probably with corbelled stone (like the beehive huts in western Ireland), but these have long since collapsed. However, the massive supporting walls remain. The complexes have been covered by canopies to protect them from the elements - they're supposed to last 30 years and in the meantime scientists are working on a different solution. It was about a half-mile walk down to the Mnajdra temple site and the weather was perfect and the views were magnificent. Mnajdra is the more elaborate complex with three temples side-by-side, each with its own trefoil plan and unique orientation. The decoration and texture they carved on the stones was super cool. Just off the coast to the south of these temples is the islet of Filfla, the smallest of Malta's five island archipelago. When the British controlled the island, their military used the island for target practice! In 1970 Filfla was declared a nature reserve and is home to two species of lizard and snail not found anywhere else in the whole wide world. Visitors aren't allowed to visit since unexploded shells from the British armed forces still lie in the surrounding waters... yikes! Then we hopped back in our rental car and drove just a few minutes east along the coast to the town of Wied iż-Żurrieq. You can see the little Maltese boats queuing up to take visitors to the famous Blue Grotto. Awesome Minis in the parking lot. The tiny harbor town is set in a narrow inlet in the cliffs off the coast and is the departure point for those looking to see the Blue Grotto by boat. 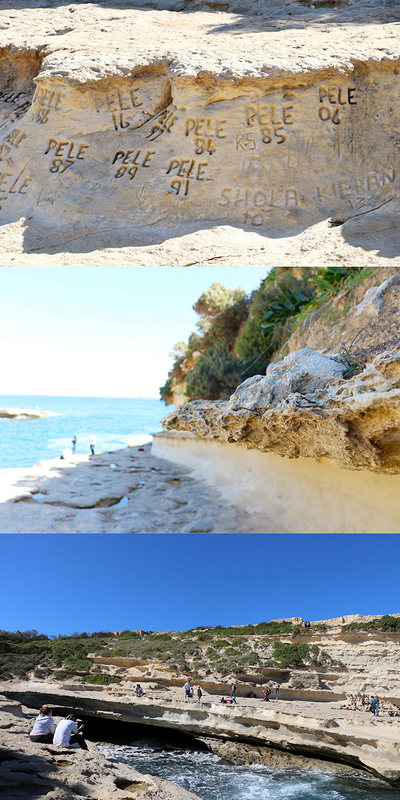 A few cafes and stores sit above the little harbor and are a great place to sit and take in the views and sun. But, ain't nobody got time for that! 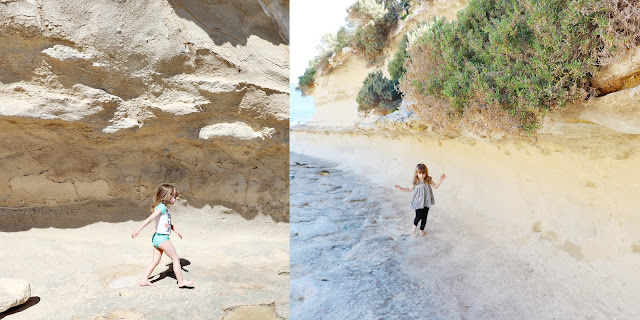 We had things to do and grottos to see so we made our way down to the boats. The brightly colored fishing boats that crowd this and other harbors around the coast have become one of Malta's national symbols. Painted boldly in blue, red, and yellow, with the watchful "Eyes of Osiris" on the bows to ward off evil spirits, these boats carry much of the heritage and history of this island nation. Reminds me of Greece with all the blue and white. We're on a boat. Almost. After getting our tickets we boarded the next available boat and pushed out to sea! 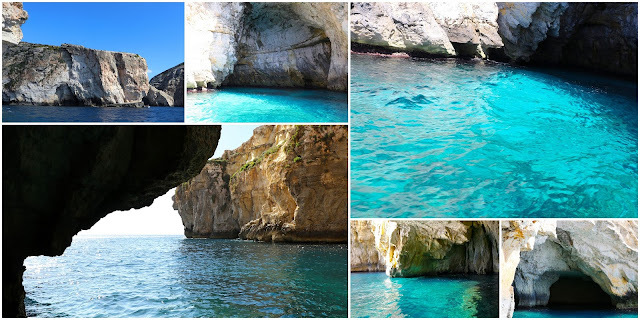 These boat trips take in seven caves along with the Blue Grotto and give visitors a great, sea-level view of the gorgeous coastline. Peaking through a window. Maybe in a few hundred (thousand? million?) years this will be a new Azure Window for visitors to marvel at. The real Azure Window collapsed just two days before our visit. Very sad day for Malta - half of the tourist maps, postcards, trinkets, paraphernalia, and pamphlets will have to be reprinted sans the Azure Window since it's no longer there. The water was so clear and blue! The highlight of the excursion is seeing (and going through and under) the massive Blue Grotto, a huge natural arch in the sea cliffs. After finishing our boat ride we drove up to the lookout point on the cliffs above to admire the Blue Grotto from land. Gorgeous. Looking south from the southern coast of Malta. We continued circling around to the east to our next stop at the Għar Dalam Cave and Museum. The kids loved the colorful benches along the pathway down to the cave and asked me to snap pictures of them. Gladly! 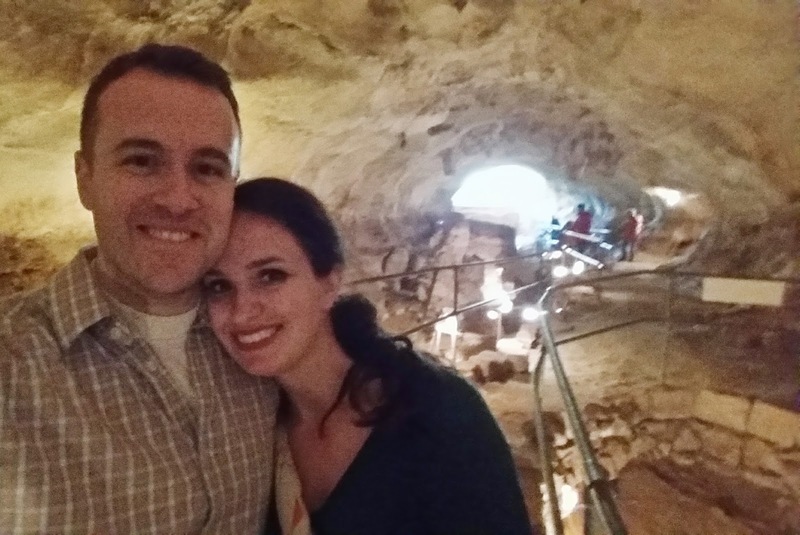 Għar Dalam is a 145m long limestone cave that has yielded a huge array of fossil bones and teeth. The lowermost layers of the cavern are over 500,000 years old and held the remains of everything from dwarf elephants to hippopotamuses to micro-mammals and birds. There was a beehive at the entrance and the buzzzzzzzing echoed so loudly throughout! Poor Jane was in a right state because she's terrified of bees after running away from one last summer which resulted in her falling down a hill and breaking her collar bone. I'll never forget that sound! All the animals are of European type, suggesting to archeologists that the island was once attached to Italy rather than northern Africa. Last stop: St. Peter's Pool! Our little adventurer Jane was ready to strip down to her swimming suit and hop in! The seas were a little too wild for the kids to really dive in because of the crazy winds and waves so we consoled them by getting splashed and playing around in the little pools that filled up with the larger waves. "Pele" seems to be a frequent swimmer here. The large, flat expanse of rocks around the swimming spot make for the perfect sunbathing platform. Such an awesome natural wonder! And that concludes our fabulous trip to Malta! I highly recommend adding it to your bucketlist! Fun for everyone! Our next big adventure: a road trip through southern France all the way to the micro-country Andorra and back! Wow!! What a gorgeous place!!!! I am LOVING that first photo of Fox! Can't wait to see how you scrap that one!!!! We have a 'natural' bridge here in Payson, AZ.! It's quite amazing!!!!!!!!!!!!! So glad you did the Blue Grotto boat ride - definitely one of our favorite things when we were on Malta! Great recaps of a great trip!